Who says movie stars can't be nice? Check out these images, folks, from the Oscars. 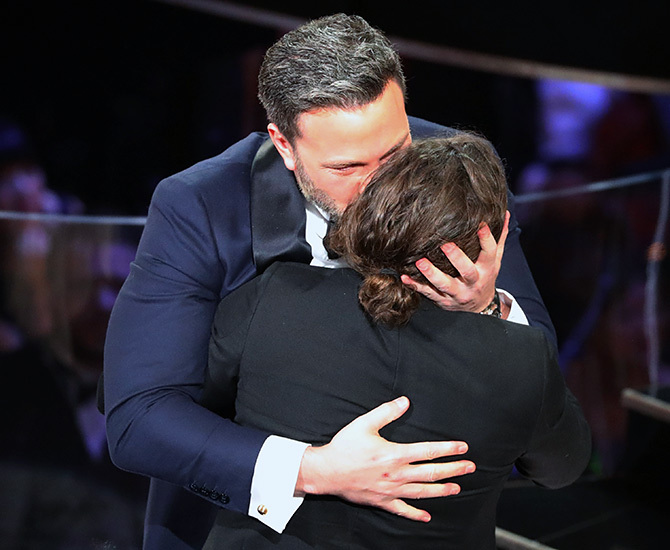 IMAGE: For us, the image of the evening: Casey Affleck, right, hugs big bro Ben after winning the Best Actor Oscar for Manchester By The Sea. Between them, the Affleck boys have three Oscars. Ben won Best Director for Argo and Best Screenplay (with best pal Matt Damon) for Good Will Hunting. Caleb Casey McGuire Affleck-Boldt (August 12, 1975) is three years younger than Ben (August 15, 1972). He has been nominated for an Oscar before, for Supporting Actor for The Assassination of Jesse James by the Coward Robert Ford. Ben is not his only famous movie relative. Casey used to be married to actress Summer Phoenix, Joaquim's sister. 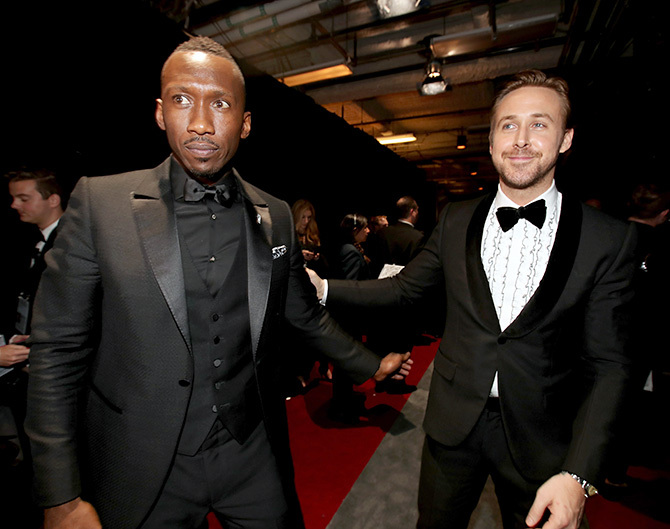 IMAGE: Mahershala Ali, left, and Ryan Gosling backstage during the Academy Awards. Ali, who won the Best Supporting Oscar (Moonlight), played a key part in The Place Beyond the Pines, which starred Gosling and his partner Eva Mendes. Ali may be more familiar to Indian audiences for his work in House of Cards, where he played the lobbyist Remy Denton, and The Hunger Games, where he plays Boggs. Gosling was nominated for Best Actor for La La Land, but, alas, didn't win. IMAGE: How nice to see two of the most exciting members of the British brat pack together? 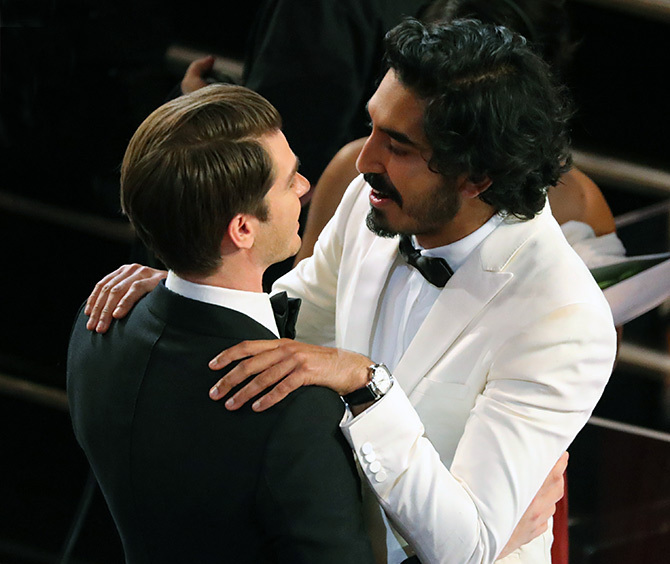 Dev Patel and Andrew Garfield were both nominees this year. Dev in the Supporting Actor category for Lion and Andrew for Best Actor in Hacksaw Ridge. Neither won, but be sure that the Academy will see a lot more of these boys in coming years. IMAGE: Ever since they played Sister Aloysius Beauvier and Mrs Miller in the 2008 film, Doubt, the finest actress of our time and one of the most versatile actresses around have been close friends. In the weeks leading to the Oscars, Meryl turned up when Viola was honoured with a star on the Hollywood Walk of Fame in January. 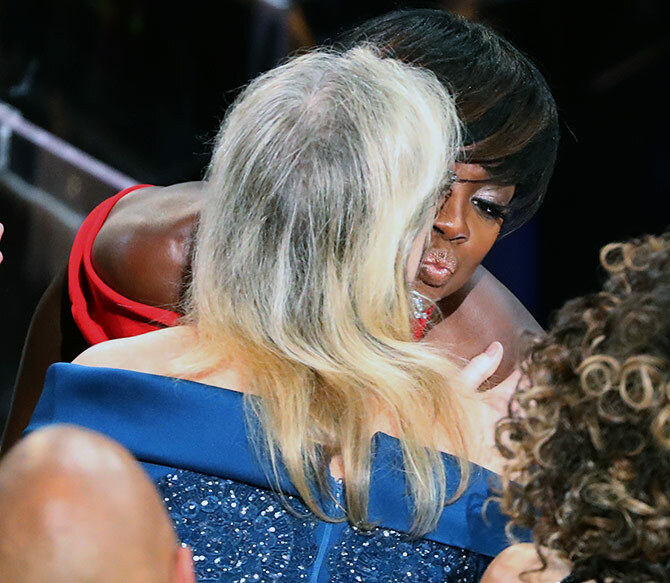 Days later, Viola revealed some juicy nuggets about Meryl when she introduced her before the Cecil B De Mille Award at the Golden Globes. Like at the Globes, Viola won the Oscar for Best Supporting Actress (Fences). Meryl was not expected to win for Florence Foster Jenkins, her 20th Oscar nomination, not because she is 'over-rated' as the Orange Flamethrower in the WH unfairly (but then being fair is not a DJT quality) said she was, but because her performance this year was overshadowed by the incandescent Emma Stone, the amazing Ruth Negga and the astonishing Isabelle Huppert.